Why choose figs for baby? They are packed with antioxidants & fiber, and are an excellent source of calcium, manganese, iron, and potassium, which makes them a tasty as well as super-healthy fruit to serve baby. 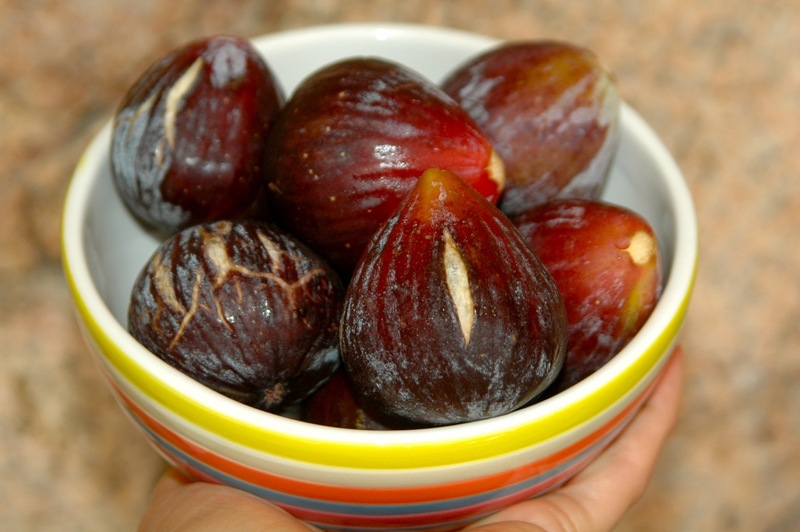 Figs have a delicately sweet flavor, which makes them ideal as a first food for baby. Fresh figs can be introduced from six months on and are a healthy addition to baby’s diet; however, dried figs are recommended from two years on due to their high sugar content. Fresh figs can be eaten with the skin on (which retains most of the flavor and nutrition), although some recipes suggest that they be peeled—in jams, for instance, to ensure a smoother texture. When fully ripe, fresh figs become very soft, with the skin somewhat wrinkled, and have a honey-like nectar that oozes from the bud side. At this point it is somewhat difficult to peel the thin skin, so it’s wise to pick or purchase them before they are fully ripened. Step 1: Cut or pull the stem off, then score (make an “X”) the top of the fig with a sharp knife. Step 2: Slightly spread out the four sections. Place a sharp knife between the skin and the pulp on each individual piece, then slice through about ¾ of an inch down. Step 3: Peel the skin (from top to bottom) using your hands or a sharp knife, until you reach the bottom side of the fig. Remove and discard the skin. Step 4: Cut off the bottom side of the fig with the remaining skin, leaving only the pulp. Has this post piqued your interest in how to prepare fresh figs? If so, here’s a delicious and healthy recipe to prepare for baby that the entire family will enjoy too! I've got tips for peeling & preparing this delish fruit just for baby. Step 1: Peel banana, then chop into quarters. Step 2: Peel the figs, then add to a blender with the bananas and all the remaining ingredients. Step 3: Blend on high speed for 1-2 minutes until combined and smooth. *If too dense, add additional milk as needed, until you get the desired consistency.